In December 2018, Guard-All Building Solutions received certification in accordance with the ISO 9001:2015 standards. 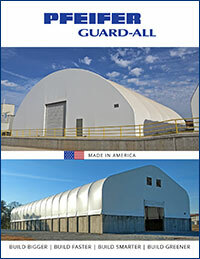 The A660 Standard requires that the Guard-All’s production facilities, staff, and quality assurance systems are capable of consistently producing quality steel buildings. To ensure that these design and production standards are met and maintained, the A660 Standard requires our manufacturing facility to be certified by a certification agency, such as the Canadian Welding Bureau. As of August 2011, Guard-All Building Solutions has been certified in compliance with CSA Standard W47.1 Certification of Companies for Fusion Welding of Steel by the Canadian Welding Bureau. Guard-All Building Solutions has received Clark County Department of Building (CCDB) approved metal building fabricator status.